On the football field, Leilehua linebacker Robert Siavii is fearless and loves to hit, according to Mules coach Nolan Tokuda. When Leilehua lost its top two quarterbacks in the middle of the OIA season, there were whispers around Wahiawa that the season might be over. But there were few doubts over at the Mules' practice field. That's because linebacker Robert Siavii and the rest of his mates on defense knew that Leilehua would be OK as long as it didn't let anyone score. And thanks to Siavii's leadership, they came close to doing it, riding their defense and just enough offense into the state tournament. Siavii is a Leilehua co-captain. The OIA champion Mules have a bye this weekend and will play in the state Division I semifinals at Aloha Stadium the following week. here's a lot of love going around in Central Oahu these days, and for good reason. Even in an average year, the residents of Wahiawa are crazy about their football Mules. After claiming Leilehua's first OIA championship in 23 years last Friday, coach Nolan Tokuda's squad has the sleepy town of Wahiawa in a downright frenzy. Mules fans showed up en masse at Aloha Stadium to watch their boys beat longtime division rival Waianae, 12-3, and capture Leilehua's first OIA football crown since Hugh Yoshida's Mules did it in 1984. After the game, nearly 200 faithful beat the team bus back to the school to greet their champions with signs, cheers and blaring horns. A big reason for all the excitement has been the outstanding play of the Mules defense, led by senior playmaker Robert Siavii. "He is an exceptional athlete," Tokuda said. "He played safety for us the past two seasons, and even punted as a sophomore. He plays a little receiver. He can do it all. Our scheme allows him to fly around the field and play fast. He's fearless and he loves to hit." At 6-foot-2 and 200 pounds, Siavii provides the Mules with a physical, athletic presence at strongside linebacker to key their 4-3 defensive scheme, which limited the opposition to 204 yards per game during the regular season -- including just 91 rushing yards per outing. The third-year starter has been Leilehua's big-play man on defense, with five interceptions and several key stops, drawing interest from the likes of Utah, BYU, Hawaii, New Mexico State and Idaho. "I give all the credit to my coaches and my teammates," Siavii said. "Coach Tokuda and our other coaches do a great job preparing us, and they've taught me so much, not just about football. Our D-line does such a great job creating pressure up front. I just do my job." In their postseason run to the OIA championship, Siavii and company have been at their best, allowing only 142 yards per game. Against Castle in the Mules' OIA playoff opener, Siavii returned an interception 35 yards for a touchdown and recorded a safety on a sack to help Leilehua put the scrappy Knights away, 36-13. Siavii also scored a touchdown while lining up at wideout in the Mules' thrilling overtime upset of Mililani in the OIA quarterfinals. In their OIA semifinal win against Farrington at Aloha Stadium, Leilehua held the Governors to a field goal on 76 yards rushing to win 7-3, and Siavii had two interceptions and forced a fumble. The Mules returned for the title game a week later to put the clamps on the Waianae attack as the Seariders only netted 106 yards of total offense, with Siavii recording a sack, a tackle for a loss and a pass breakup. 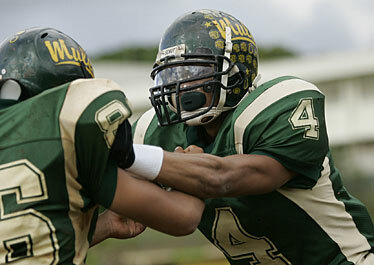 "Robert has definitely come up big for us this year," said Leilehua linebackers coach Darren Matsumiya. "But he plays assignment football. He's not just running around trying to make plays out there. Our defensive coordinator, coach (Mark) Kurisu, puts together a game plan for each opponent, and during the week we try to get the kids to understand the scheme. Robert does a great job of taking the game plan to the field, making his reads and seizing the opportunity to make the big plays." As good as Siavii is on the field, Tokuda beams when speaking of his star linebacker's character off it. "He's got it all -- size, speed, athleticism. He's a great football player." Tokuda said. "But his best attribute is his character. He performs community service. He's dedicated to his academics. He is a gentle giant; he always greets his teachers with a hug, and thanks them for their help, and he puts the team before himself. 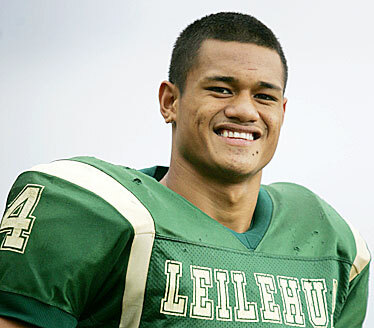 He exemplifies what we want a Leilehua football player to be." The eldest of seven children, Siavii has had a lifetime of leadership training. "I am the oldest, so I gotta take care of them," Siavii said of his siblings, who range in age from 1 to 13. "Sometimes I have to come to practice a little late and do the extra running, but family comes first. But these are my brothers, too." Co-captains Siavii and Peter DeSaulniers have had to lead the team through some adversity. An up-and-down regular season, the loss of both their first- and second-string quarterbacks against Castle, and an on-campus incident resulting in suspensions just before the Mules' playoff game at Mililani tested the character and cohesiveness of the team. "This team is all about brotherhood and love," Siavii said. "No matter the obstacles, we have stuck together this year. On the field, off the field, we've had our share of adversity, but it has made us stronger. Any tribulations we've had, we know that the past is the past, and through it all we emerged as a team." "There's a lot of love on this team," said the senior free safety. "We have worked hard together to make our community proud of us and we never gave up." With Siavii teaming with Art Laurel and Josh Cruz to form perhaps the best linebacker corps in the state, and Edieson Dumlao, Rico Newman, Allen Macam and quarterback Andrew Manley making the big plays on offense, Leilehua has built a considerable head of steam as the Mules prepare for the upcoming state tournament. "This team is a family," Siavii said. "When this season is over, hopefully a few weeks from now, I will miss my boys. I will miss this team. But right now we have business to take care of, and I hope we can make some more memories."